This year for the Sci Fi Experience, I’m off on The Great Khan Adventure, tracing the story of Khan Noonien Singh through books and movies. So far I’ve watched some of Star Trek: The Original Series, and read the first book in Greg Cox’s Khan trilogy. Today I’m looking at the second book, Star Trek: The Eugenics Wars: The Rise and Fall of Khan Noonien Singh, Volume Two. The first book covered Khan’s childhood and adolescence, focusing mainly on Gary Seven, Roberta Lincoln and mysterious cat Isis, and their work to protect the Earth during the Cold War. This book brings us into the 1990s, with an adult Khan and his quest to conquer the Earth. We still have plenty of Seven and Roberta, and their efforts to contain the threat of Khan and the other genetic supermen (and equally powerful superwomen). I enjoyed this book quite a bit, though I have to note that it may not be what all readers are looking for. Cox’s goal appears to be to reconcile Star Trek history and real history; I find that hugely interesting, but as a result of that choice (rather than simply presenting altered history–an alternate timeline, perhaps) the Eugenics Wars goes on in the shadows. Khan “rules” a quarter of the Earth by pulling the strings of officials from behind the scenes. Presenting a war where most of the population doesn’t know it happened…well, that limits the potential for large-scale conflict. There’s still plenty of action, but mostly in small, pitched battles between individuals. Cox also gives ample time to other genetic supermen (and women–there’s no easy way to say that–superpeople?) which I have somewhat mixed feelings about. Many are extremely interesting, especially Chen Tiejun and her Amazons, but they at times start to feel like a distraction too. Roberta spends a lot of time infiltrating General Morrison’s Army of Eternal Vigilance in Arizona, and it feels like, well, a lot of time not spent on Khan. However–we get lots of time on Khan too, and we see him develop as a ruthless but nuanced villain. He sees the many problems in the world and believes that he is destined to eradicate hunger, war and want–by conquering the planet, and when anyone gets in his way, his retribution is swift. I like that complexity of benevolent intentions through villainous means–and we also see Khan grow increasingly harsh and merciless as the story goes on. We also see the Enterprise crew in a frame-story. It continues the story of a colony of genetic super…people, and while there’s some excitement, it’s very much backseat to the Khan and Seven story. It’s not much of a spoiler to say that the novel ends when Khan and his followers leave Earth. The next chapter for Khan is waking up from suspended animation in the Enterprise‘s Sickbay (and promptly threatening Dr. McCoy’s life). 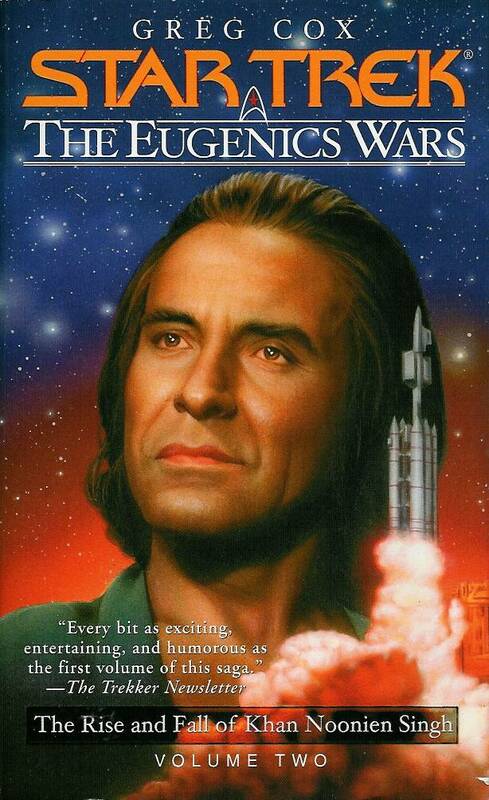 I already watched “Space Seed,” so the next step on The Great Khan Adventure is the final book by Greg Cox, To Reign in Hell: The Exile of Khan Noonien Singh. Stay tuned! I may have mentioned it in the last review, not sure, but I really like the idea of mixing Star Trek history with real history, especially as the original Trek kind of backed future writers into a corner by putting Khan’s time period not too far into the future, now in our past. Very good idea to try to merge the two as it gives the story more weight, in my opinion, from what you’ve written about it. It is fun experiencing these with you and I hope you continue to enjoy exploring Khan’s history.